Pablo Picasso’s Femme au béret et à la robe quadrill ée (Marie -Thérèse Walter) brings to a climax a turbulent and highly charged year. The great masterpiece of his career Guernica was created in 1937, and in the final month of that momentous year he painted this vivid, poignant and intense image of his golden muse Marie -Thérèse Walter. This defining work will be offered for the first time as a star lot of Sotheby’s Impressionist & Modern Art Evening Sale in London on 28 February 2018. The women of Picasso’s life are the fulcrum of his creative genius , unquestionably essential to his creative and intellectual processes. 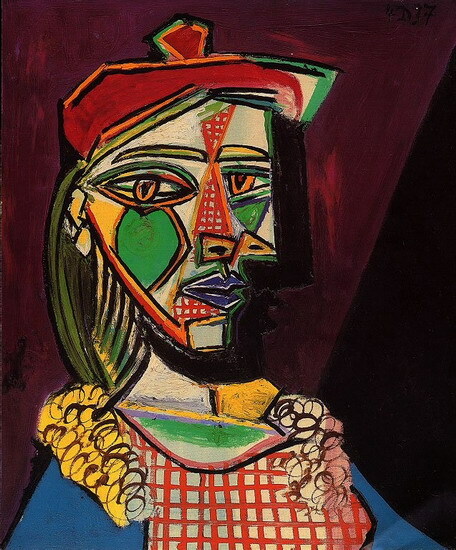 Femme au béret et à la robe quadrillée (Marie -Thérèse Walter) charts Picasso’s evolving relationship with his muse Marie -Thérèse Walter , to whom he was ostensibly still devoted at the time, and the increasingly dominant presence of his new lover Dora Maar. Indeed, the work appears to have been used as a means for explorin g his feelings for the two women. There is a conscious blurring of the two styles inspired by the two muses, reaching its pinnacle in the silhouetted ‘other’ that emerges from behind the main subject. Whether it represents Maar or indeed a self -portrait, the implication is that of duality and conflict. Picasso is quoted: ‘It must be painful for a girl to see in a painting that she is on the way out’. The beginning of the decade marked a period of sublime happiness for Picasso, as witnessed in the extraordinarily sensual and lyrical paintings of Marie -Thérèse in 1932 – which are the subject of the current acclaimed exhibition at Musée Picasso in Paris and will feature in a forthcoming show at Tate Modern in London. This extremely dynamic painting reveals just how much things had changed for him in the intervening five years. The work’s sharp cubistic edges, thick impastoed paint and black outlines give it an immediate visual impact – the emphatic execution and bold palette packed with emotional charge. The depiction of Marie -Thérèse has matured from the voluptuous curves and sleepy, passive suggestiveness to the woman who gave birth to Picasso’s child. The portrait suggests that she continued to be of central importance to the artist . These personal disruptions in 1937 were mirrored by wider political unrest in the artist’ s native Spain, the year marked by a succession of shattering events including the bombing of the small to wn of Guernica in Basque Spain – which prompted the grand mast erpiece Guernica and a harrowing series of weeping women. This portrait, with its green welling tears, has been identified as a continuation of and counterbalance to the sequence of weeping women : ‘[she is] entirely reduced to inner tears – a resigned sadness, nonetheless suffused with love. Monumental in scale , highly charged and painted in vivid colours, Le Matador is the culmination of a life -long obsession of Picasso’s that remained one of the most important themes throughout his career. The painting is a brilliant display of the virtuosity with which Picasso combined the complex elements that had shaped his life and art and stands as a defiant tribute to the heroic figure of the matador – embodying the artist’s own Andalusian machismo as the master of modern art takes centre -stage in the arena. Picasso had begun to feel that his time on this earth was running out, and so engaged in constant conversation with the great masters before him – Goya, Velasquez and Delacroix – following the traditions they had set in order to reinvent them and make a lasting mark . Appearing at auction for the first time, the work will be offered in Sotheby’s Impressionist & Modern Art Evening Sale on 28 February 2018. The bullfight became a symbol for the most public display of violence, bravery and ability and for Picasso its attraction certainly lay in its powerful contradictions: grace and brutality, entertainment and tragedy, and ultimately, life and death. This work is unique in conveying a human dimension that is lacking in many of the earlier depictions, with the matador’s stylised face and large, wide open eyes revealing a v ulnerability and sense of mortality that reflect the artist ’s own concerns. Unlike his other depictions of the matador from this period where the figure is depicted against a plain, monochrome background, this painting uniquely combines the image of the matador resplendent in an elaborate costume with that of the arena. The lower half of the background represents the sand of the bullfighting ring, with hundreds of spectators in the upper half. The experience of being taken to the bullring by his father at the age of eight had a strong impression on Picasso , and his first painting, Le petit picador jaune , was of a matador on a horse in the arena observed by the spectators behind him. It is all the more fitting that at the end of his life, he returned to the celebrated imagery of the bullfights that he had grown up watching. Despite leaving Spain to live in Paris in his youth, Picasso retained a sense of Spanish identity , and the matador was the character that allowed him to draw attention to his heritage. During the last years of the nineteenth century Picasso stayed in Madrid, where he copied the old masters at the Prado, and was no doubt influenced by Goya’s bullfighting scenes. Picasso’s personal memories became intertwined with his artistic heritage, and in this final series of matador portraits the ghost of Goya is strongly present. Le Matador was included in the exhibition of Picasso’s last great works, organised by Jacqueline at the Palais des Papes in Avignon shortly after the artist’ s death in 1973 – presenting the closing period of his oeuvre on the historical walls of one of the most important medieval Gothic buildings in Europe.